Hello Everyone! I hope you are all well. I am feeling super happy because on Saturday morning my girlfriends are picking me up and we are going to an all day crop. Love it!! A day filled with great conversations, loads of laughs and tons of great products at our fingertips (it will be held at a store). So nothing pretty much should ruin this week while I daydream of the fun. When you have two little ones around, crops are like little pieces of heaven. Ok, no desk photo today but I want to share what I have been working on – a card for a card contest. I wouldn’t normally enter, I am more of a watcher. I always read the contests and that voice of mine talks me out of it but my dear friend Ashley pushed me to do it and it was just what I needed to squelch that procrastinator bug I get when I am scared of doing something. My first card for a card contest. If you click here you can see more about this card. That is all I have to share today. Which is probably rather refreshing since I tend to ramble these days. 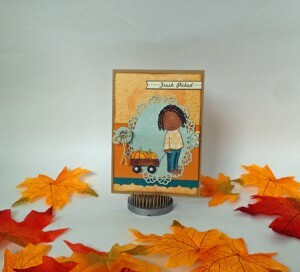 Have a great time with your girlfriends cropping, love the card you have made especially your little fall leaves in your photo.. So sorry about the name thing. My day has been crazy 2 meetings and not very much sleep and I need to be crafting right now. Once again I am sorry. Hi there Belinda, your card looks great, never be afraid to enter challenges they’re so much fun and you could possibly win a prize too. I to was afraid but over the past week i have enter several challenges. Have an amazing time this weekend. I totally understand what you mean about little ones. Anytime spent on yourself is amazing. A very cute card. Enjoy your day out at the crop. You card is gorgeous. Have fun at your crop. your card is beautiful, good luck! Good for you joining the contest! Your card looks awesome, I hope you win!! Have fun at the crop! I almost never enter contests but I do quite like the challenges, if I have time. I do love the card and best of luck with your entry! Well done on entering the contest! Your card is gorgeous. background spellbinder color is so striking! Great card. Good luck with contest!!! Like Tamika said – your staging of the card is perfect!! !